We visit Ten Ren's Tea, George Street City, for great Taiwanese food and amazing tea. 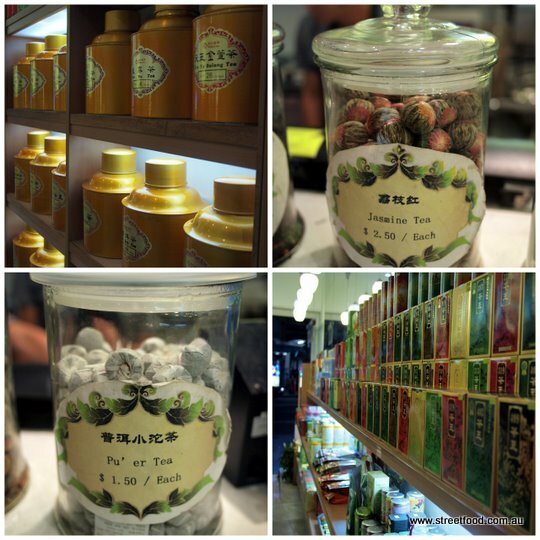 We'd walked past Ten Ren's Tea many many times thinking it was just another bubble tea joint. Then one day we noticed they had a dining room upstairs and 'Tea Flavoured Soy Duck with Vermicelli' on the menu. We trembled with food-nerd excitement. The upstairs dining room is basic and cheerful. We reckon that spot by the window would be lovely during the day. Other folks were dining and some folks were just drinking tea and chatting, it seems like a place where folks come to catch-up and unwind. Tea is serious business here, we have to give it a try. The list of teas is daunting so we ask the waitress for help. She suggests a pot of Osmanthus Oolong. We baulk at the $9.50 price tag but when it arrives we see the pot is packed with tea leaves. The tea is very strong in flavour (and caffeine!) and the staff will cheerfully top it top it up with more hot water. Taiwanese Spaghetti with Tea Flavour - $7.80. A homely spag bolg with a Taiwanese twist, love it. The tea eggs and pickles really make this dish. Tea Flavoured Soy Duck with Vermicelli - $8.80. This is the dish I came for. Lovely hunks of duck in a light peppery broth. The glass noodles do a wonderful job of soaking up the flavours. So tasty, so cheap. Tea Flavoured Pork with Rice Noodles - $8.80. The broth in this is even nicer than the duck soup, it has an extra sweet, meaty bass note. The soup comes with two big chewy, meaty hunks of pork rib. For more Ten Ren goodness see the great post on grabyourfork. oh i thought that place was just a tea house too. That pork soup looks sensational and so cheap as well! It's always amazing the little thrill when you discover a place is not what you thought. I'm going back for more of those dishes, there is a stewed beef with my name on it.